Late in the afternoon, as dusk creeps along the eastern tip of the island, dozens of sulphur-crested cockatoos appear. Crazy, cheeky, screeching, and circling, they size us up as we stand on our balcony on the 17th floor of the Reef View Hotel. Intrigued by the noise, an audience forms as others gather on their balconies to watch the show. A cockatoo lands clumsily on the balcony railing. As I pick up my camera, another approaches. Another touches down in a mess of white feathers, then another and another, obstructing our stupendous view. They hop awkwardly along the railing and it’s impossible to miss the cheeky joy they take in nagging one another. The air is pierced by their shrieks and shrills. As I adjust my focus and peer at their bobbing heads through my Canon, they peer back with intelligent black eyes. The aromatic scent of eucalyptus trees and salty sea air drifts on the breeze. The tropical fragrance is powerful and the air clean and pure. Nestled in the heart of the Whitsundays, Hamilton Island is a launch pad for excursions to nearby islands and the Great Barrier Reef, home to a kaleidoscopic world of rainbow-coloured marine creatures. It is the largest protected marine area in the world. Hamilton Island was once home to the Ngaro people, a seafaring people who inhabited the Whitsunday Islands until 1870. Later owned by Queensland developer Keith Williams, the island was destined to become a grazing property until a change in circumstances resulted in the island being developed into a tourism destination. Australian winemaker Bob Oatley and his family bought the island in 2003 and further developments included the opening of the luxury resort Qualia, a yacht club and an 18-hole golf course on neighbouring Dent Island. Despite the development, over 70 per cent of the island’s 740 hectares remains in its natural state. Our scheduled afternoon on Whitehaven Beach, the largest of the 74 islands in the Whitsundays, did not look promising. The grey clouds lower like a curtain around the warm morning sun along with my mood. With only the odd glimpse of turquoise water visible during the trip there, I sit inside wearing a heavy jacket watching the others on deck enjoying the ocean spray. My mood lifts instantly as we arrive on Whitehaven and my feet sink into the white powdery sand. This seven-kilometre stretch of pure white brilliance is a reminder of why the beach continues to be voted the world’s best. Discovered in 1879 by Staff Commander E.P Bedwell, of the British Royal Navy, Whitehaven’s sand is 98 per cent pure silica giving it a bright white colour. Unlike regular sand, the sand on Whitehaven inhibits the heat of the reflecting sun that begins to peek out from behind the grey ribbons above. A slight cool breeze picks up as we drift north along the beach. We study the tiny pillows of sand that have been flicked out by crabs along the beach, and with childhood delight enjoy the sensation as the pillows pop underfoot. We spot small stingrays and a green sea turtle. Reminded by the crew that white sand polishes jewellery, we each grab a handful of wet sand, and gently swirl and massage it into our wedding rings. As we board, a quick rinse in the salt water reveals a sparkling memento of our time on Whitehaven. Often upstaged by white sand and clear blue waters, yachting regattas and lavish honeymoon resorts, food probably isn’t the first thing that comes to mind when you visit the Whitsundays. However, Coca Chu Restaurant on Hamilton Island is so good, it could be a destination in its own right. Headed up by Chef Adam Woodfield, previously of New York’s Manhattan restaurant Betel, Coca Chu’s menu is dominated by bold Southeast-Asian flavours. Located in the beach house overlooking Catseye Beach, the space is elegant and relaxed. We start our tastings with a bottle of Robert Oatley Signature Series Shiraz, with blueberry and spice flavours and fine tannins. 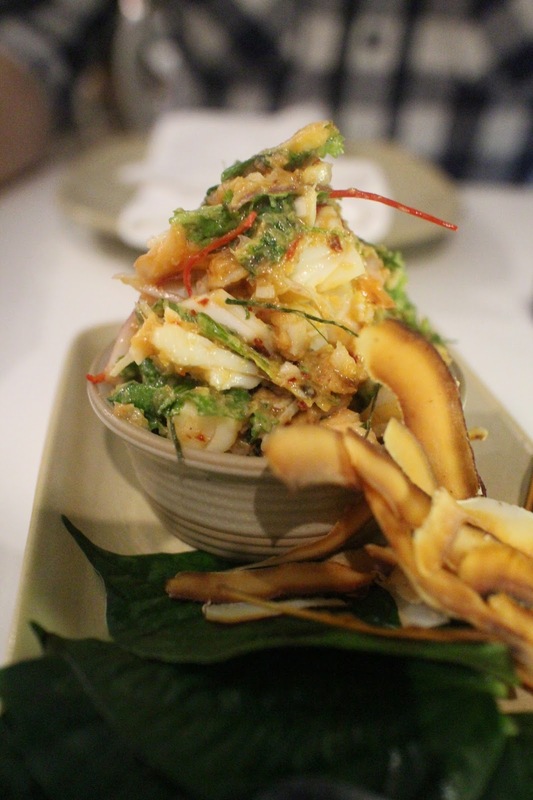 Our starters consist of betel leaves with lobster, lime leaf, peanuts, roasted coconut and saw tooth coriander ($24) and pork and prawn dumplings with coriander, ginger and Chinese black vinegar ($18). The ingredient are fresh, with memorable textures and robust flavours. We try the twice-cooked half duck with plum sauce, lemon and prickly ash ($40) and then I decide on the green curry of tiger prawns with pea eggplant, baby corn and samphire ($38). Dessert is warm sticky rice topped with vanilla bean cream and fresh mango, and a trio of smooth sorbet of coconut ash, kaffir lime and mandarin and lemongrass ( both $12). The next morning, we enjoy breakfast with the koalas at the island’s wildlife sanctuary. The mood is casual, relaxed, happy and unpretentious. The food is good, too. A standard buffet of cereals, fruit, juice and pastries is complimented by a chef’s station where we order an omelette and French toast. Where: Hamilton Island has direct flights daily from Sydney, Melbourne, Brisbane and Cairns, with Jetstar, Virgin and Qantas. Regional charter flights can also be organised from Mackay, Proserpine and Airlie Beach. Ferries sail to Hamilton Island throughout the day from Shute Harbour, on the mainland. Notes: The Reef View Hotel’s standard nightly rate starts at $360 but check with the hotel and discount accommodation sites for special rates and offers. 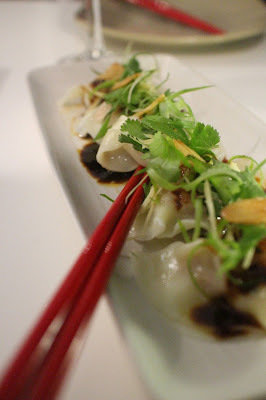 Dining: Coca Chu Restaurant: Offers a traditional three course selection. Guests are encouraged to share dishes. Starters from $8, Mains from $26, Desserts $12. The Food Mentalist & Guest also dined at Bommie Restaurant at Hamilton Island Yacht Club and at Pebble Beach at Qualia. As guests of Hamilton Island, they travelled to Whitehaven Beach courtesy of Cruise Whitsundays. Peter and I love Hamilton Island... would love to get back there someday! Great post, Erin. Glad to see you enjoyed Coca Chu as much as I did - Hamilton Island is a top spot!